For hedging, plant 25cm apart (10''), which will fill gaps in two seasons. The Classic hardy English Lavendar for hedging, these fabulous multi-trimmed plants are the ideal start point combining value with performance. Big enough to plant out all year, and will flower in first season too, yet great value. 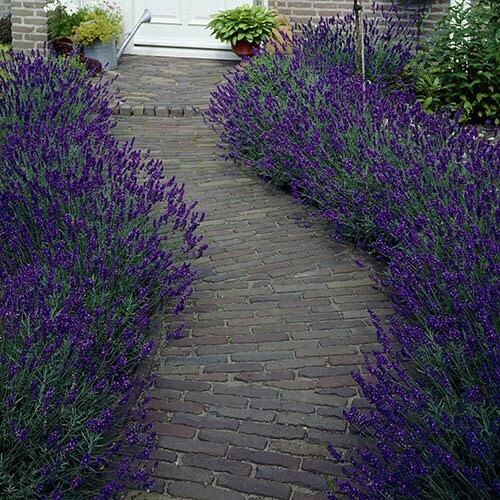 Plant about 25cm (10in) apart for a dense continuous Lavendar hedge which will fill out in 2 seasons, for that iconic look along pathways, driveways or lawn edges. Also great with several in large pots too. The flowers are great for cutting and drying too in Summer, and are a mecca for bees. In late summer, clip the plants back lightly after the flowers have faded. Cut the stems back by a few inches, but not so far that the stems are bare of live foliage, and plants will then have time to produce new shoots before winter dormancy. This drought-tolerant plant thrives in a sunny border, container, herb or gravel gardens. Best planted between April and May when the soil is warming up, lavender thrives in most free-draining soils in full sun. Heavier soils should have some grit added to improve drainage and to open them up. Space plants 90cm (3ft) apart, or if growing a hedge, 30cm (1ft) apart or, 45cm (18in) for larger cultivars. Lavender can be grown in large pots, 30-40cm (1ft-16in) diameter, using a multipurpose or loam-based compost such as JI No 3, with some extra coarse grit, (up to 30%), to improve drainage, along with some controlled release fertiliser granules. Ensure that the compost is regularly watered in summer, although for improved cold tolerance, kept on the dry side during winter by standing in a cold greenhouse or in the rain shadow of walls.